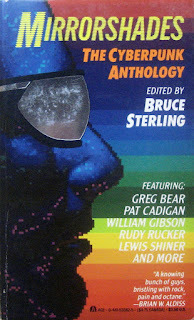 PositronChicago.com: Worldcon Recap- Is Cyberpunk Still a Thing? Worldcon Recap- Is Cyberpunk Still a Thing? 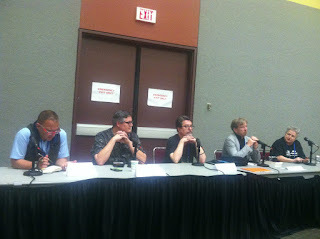 Cory Doctorow, Pat Cadigan, Matt Jacobson, James Patrick Kelly, Patrick Nielsen Hayden. Dangerously close to an all-Pat panel, we note. Doctorow: What is Cyperpunk, and what is a thing? Cadigan: That's Miss Thing to you! Kelly: Things are reasons to have panels. Nielsen Hayden: Cyberpunk as a course correction, SF noticing most SF is slightly in the past. Let's make it now, or slightly in the future. 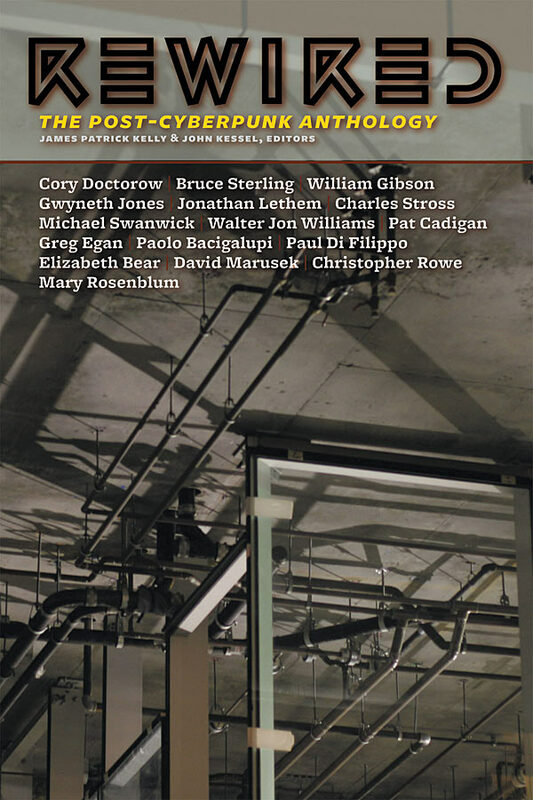 Doctorow asks the relation between cyberpunk authors and actual computer knowledge (famous example of Gibson writing Neuromancer on a manual typewriter). Panelists respond that there was a great variation on how much people knew the tech, including a good deal of disappointment with how 80s computer tech actually looked, felt, sounded. Cadigan: Cyberpunks were the first generation to grow up completely with mass media. Extrapolating mass media on steroids. Doctorow suggests that cyberpunk was not predictive so much as exemplary or exaggerative. Cadigan: Synners was more science fictional when I wrote it than now. Doctorow describes 1980 as a big year, lots of huge changes going on all over the world, panelists chime in on that. Makes sense that cyberpunk started about then. Nielsen Hayden: All cultural turns start as gnosis and end as wallpaper. Talks about received aesthetics and just running with generic formulas, versus setting off in new directions. Praises Hannu Rajaniemi's work for still doing great new stuff in a cyberpunkish spirit. 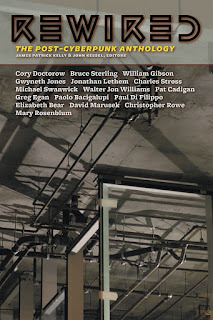 Doctorow asks Kelly to talk about the Post-Cyberpunk anthology, and if he stands by the title's implication that we are "post" it as a movement. Kelly talks about that for a bit, jumps back to Sterling saying that 6 people aren't a movement. Twelve people can be a movement. Refers to Bruce, Keeper of the Ideological Flame. Kelly says mainstream SF wasn't paying attention to the right things in the 70's/80's. Cadigan agrees, says it was still all White Guys...In Space! Kelly: Cyberpunk said you don't have to imagine the future, turn on the screen and be in the future, right now. After panelists talk a bit about what cyberpunks got right & wrong (missing cell-phones and social media, for instance) Jacobson relates a story about Douglas Adams lambasting the idea that SF can very readily predict actual day-to-day impact of widely adopted technology. Imagine phones being predicted way in advance, they'd have made films like "Attack of the 50-foot Telephone". Cadigan refers to Cordwainer Smith's The Game of Rat & Dragon & Alfred Bester's Fondly Fahrenheit as influential proto-cyberpunk. Nielsen Hayden on Gibson's story The Gernsback Continuum, a eulogy for aesthetically dead SF. Doctorow asks panelists to talk about cyberpunk as about working class interaction with high tech, and they do! Talk shifts a bit to diversity and lack thereof--Cadigan the only woman in the early cyberpunks. Nielsen Hayden elaborates a bit on how Sterling had a kind of anti-feminist-SF agenda (digs at Russ in the Turkey City Lexicon, etc. ), that probably pushed away women writers who might otherwise have been in Mirrorshades etc. Most on the panel seem to suggest that Sterling wasn't actually anti-feminist, but allowed stylistic disagreements with Russ et al. to basically push him to that position. So Doctorow asks: is newer cyberpunk more diverse? Answer: somewhat. Jacobson talks about Tech Noire as one descendant of cyberpunk, references Mr. Robot, Person of Interest, Gibson's Blue Ant trilogy. Doctorow says that Mr. Robot is about finding the difference between technology and magic. Long discussion on the FidoNet and early BBS communication between the cyberpunks, how that venue had as much to do with the early genre as Sterling's manifestos or other factors--enabled a startlingly new, instantaneous (though slow by today's standards) communication with other writers thinking about the same things, regardless of physical location. Panelists talk about cyberpunk as coming out of and being haunted by the threat of nuclear war and other disastrous conflicts. Doctorow asks: is the current moment of Trumpianism and #Brexit dischordia recapitulating the near-death experience of the Cold War? Great question and we're out of time! Two notes, by the way: Doctorow is a fantastic moderator, hands-down the best I saw at Worldcon. 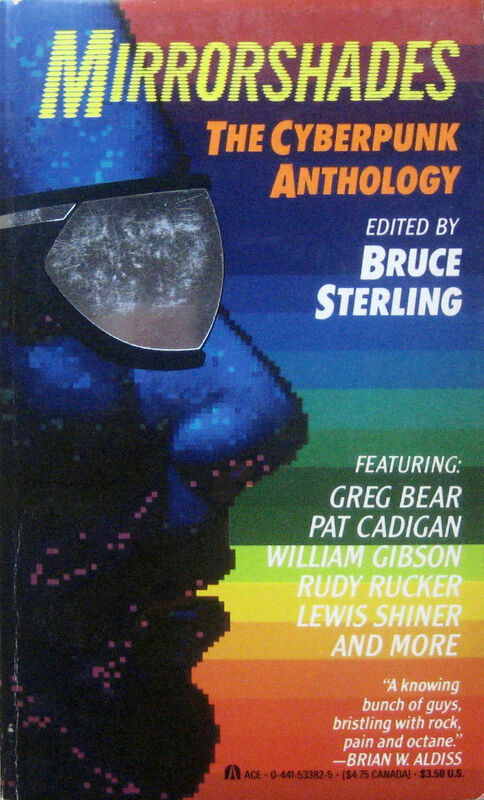 Secondly, I wonder if they asked Swanwick to be on this or if he was too over-scheduled or something, as his essay A User's Guide to the Postmoderns (on the cyberpunk/old-school/New Wave schools & fights) is a wonderful bit of SF history on this topic (and he was also in Mirrorshades). Would highly recommend tracking that essay down, as well as both the anthologies above. Just to be clear, the observation that "all cultural turns begin as gnosis and end up as wallpaper" is original to novelist and editor Tappan King, who I actually credited when I said it. Tappan says many smart things. Good writeup. You have a real knack for summarizing lively panels.